I was happy to become reacquainted with what used to be one of my favorite breweries – Unibroue of Montreal, Canada. They have always made amazing beers, but I somehow lost touch with them. And then I saw a bottle of Ale Gâteau Forêt-Noire. Well, I know the first word – ale. And being a fan of film noir, I guessed that the last word means black. Gâteau. Hmmm? I’ve heard that somewhere. Cake? What sold me was the 10.5 percent clearly marked right beneath the beer’s name. Well, that and the fact that it’s from Unibroue. So, I had no idea of what I purchased. A cakey black ale? It’s Unibroue’s version of a Black Forest cake, or what they know in Germany as Schwarzwälder Kirschtorte (Black Forest cherry torte), which is several layers of chocolate sponge cake separated by whipped cream and cherries. Yes, it’s terrible being a language idiot, trying to muddle your way through a simple beer label. Well, at least I am glad I had the presence of mind to pick up this Unibroue offering, which I subsequently learned is a special release celebrating the brewery’s 25th anniversary in 2018. They used morello cherries, a very dark-colored European tart cherry. Morellos are much darker than the bright red Montmorency grown here in Door County, and not as tart, I think. The cherry aroma comes through immediately in the nose of this luscious dark beer. 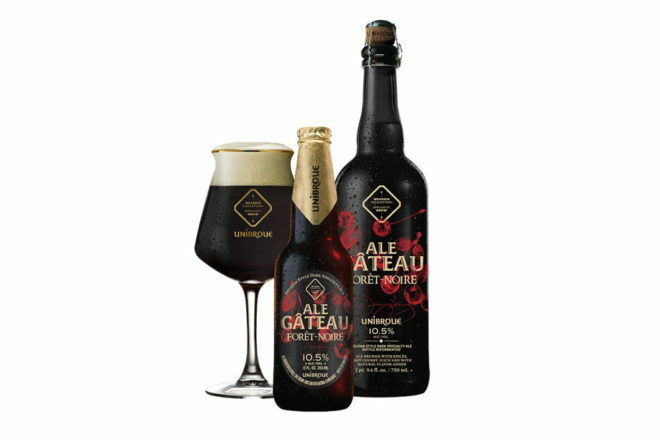 The cherries also come through immediately in the taste, and then the cocoa beans and dark chocolate flavor, but all with the light effervescent quality that Unibroue is famous for. It’s the proprietary yeast that gives it such a light touch, I think. Yes, each sip reminds me why I first fell in love with this Canadian brewery. Since this is a limited release, I would buy all you can find, if you find it. But you’ll have to get there before I do. And if you do not know this brewery, it’s time to discover it and the incredible brews they make. And, of course, as I drank this delicious Black Forest Cake Ale, I listened to Horst Jankowski’s 1965 hit “A Walk in the Black Forest,” and then Herb Alpert and the Tijuana Brass doing their version from the 1965 album !! !Going Places!!!. Did I ever mention that I once wanted to be the new Herb Alpert? It’s true.